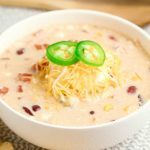 Crock Pot Cream Cheese Chicken Chili is one of the best slow cooker chili recipes out there if you're craving a creamy chicken recipe! You can use a variety of beans to make this white chili recipe! It makes a great dinner for families and can also be made low carb for and gluten free! Place chicken breast, kidney beans, tomatoes with chilies, and corn in pot of slow cooker. Season with chili powder, paprika, cumin, black pepper, and garlic powder. Add chicken broth and water. Stir to combine all ingredients. Cover Crock Pot and cook on LOW for 6 to 8 hours or HIGH for 4 hours. Before serving, take the chicken breast out of the slow cooker. Allow it to cool for a few minutes, then shred the chicken with a fork and return to slow cooker. Stir to combine and serve! You can use any type of beans that you'd like to try with this recipe. It's fun to play with flavors! You can also tweak the chili powder to add more heat or go a bit more mild.